Dwell editor-in-chief Amanda Dameron talks us through Dwell's December/January 2016 issue. 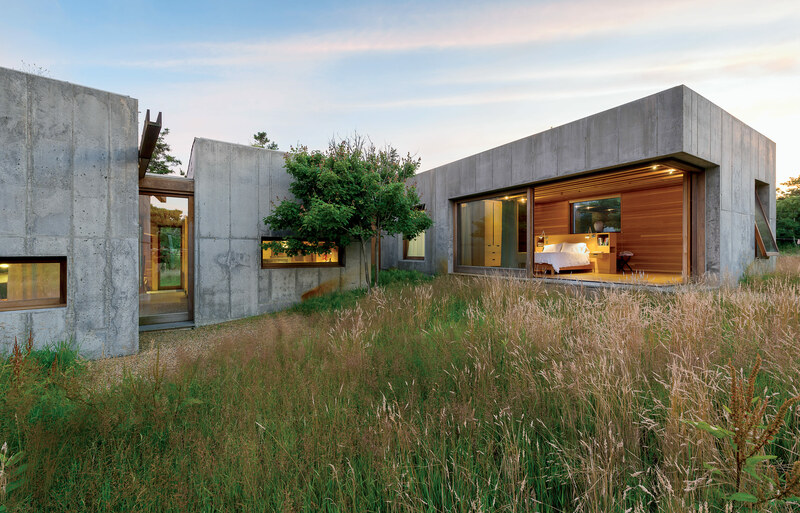 Six modular, concrete boxes comprise a five-bedroom home on Martha’s Vineyard, in Chilmark, Massachusetts. Designed with the sloping seaside site in mind, it was built to guard against potential erosion: Connected by interstitial wood paneling, each of the six units can be moved in just a week and fully installed in a few months. In one of the last industrial pockets of West Town, UrbanLab’s Martin Felsen and Sarah Dunn created a modern live-work space that speaks to the neighborhood’s history in form and function. The Dukane Precast concrete panels were acid-etched for a more finished look. Purchasing a lot off the Delaware River in Pennsylvania, Martha Moseley and Bill Mathesius adapted an unused concrete foundation—remnants of its previous owner’s abandoned plans—to create a home that’s uniquely their own. “We were inspired by the site, and our desire to have something cool and different,” says Moseley. When planning regulations limited what could be built in an English forest, PAD Studio devised a prefab structure that can be moved by crane. “The whole building is based around a steel frame, which provides us with the stability to be able to top-lift it easily,” explains designer Ricky Evans. Retirees Dr. Mary Ellen Kennedy and Robert Dault tasked architect Charlie Lazor with bringing a prefabricated 2,100-square-foot home to their lakeside property, located in one of rural Ontario’s unorganized territories. When building a house, predictability is a privilege. Think about all the variables that can wreak havoc on even the most organized program: environmental calamities, unexpected expenses, erroneous measurements. As with any complex enterprise, there are myriad opportunities for error. This is but one reason why prefabrication as a methodology offers a smart option—control mitigates risk. In putting together this issue, we are reminded that prefab in an urban setting has potential to change the way we look at housing in cities. It offers a quick way to increase the density that the growing metropolis demands; the challenges are craftsmanship and precision. Demanding tolerances are required to snap together multiple dwellings within a complex framework of structure, plumbing, and envelope. Yet, as the projects in the following pages indicate, a prefab structure isn’t simply a ready-made box. There’s a range of prefabrication that includes just walls and/or components that are assembled on-site. This may be a less iconic, photogenic vision of ready-made prefab, but it’s certainly part of tomorrow’s landscape. A middle path between on-site construction and prefab is somewhat more time-intensive, but it allows greater customization and flexibility. In the future, we will see prefab architecture expressed as various niches within a spectrum of ready-made modules and standard on-site construction. A case in point is the UrbanLab project in Chicago, Illinois. This live-work structure ensconced within a post-industrial neighborhood proves that prefab can suit a range of needs—manufacturing, residential and retail—and it can do so in a generously proportioned, thoughtfully considered way (not to mention, the project came in at under $200/square foot). As Sarah Dunn, the project’s architectural designer, noted with cautious optimism: Clients are beginning to understand that the speed at which a home can be assembled is meaningless if the end product isn’t customized to their needs. As prefab sheds its more negative associations and clients become more sophisticated about the process, architects are gaining greater license to experiment. As new and adventurous projects like the ones in this issue show, the wide range of where and how prefab solutions can be utilized continues to expand—from simply integrating panelized construction materials to creating fully modular homes that can be plugged into any setting. Consider the home in Yardley, Pennsylvania, comprised of 11 shipping containers. Here we glimpse residents empowered to design for themselves through adaptive reuse. Unafraid to take on the challenge, they found themselves embracing both the process and its highly personal, idiosyncratic result. Modular prefabrication for new construction, after all, just seems sensible on a certain level: How can one dispute the merits of easy installation, speed of construction, cost-efficiency, and, in the case of a Martha’s Vineyard house by Peter Rose, movability in the case of necessity? A structure’s ability to respond to a site is evident in this home, which sits perched atop a bluff. Another example is found in the Forest Lodge caravan in England, a demonstration of minimizing impact by building offsite and craning into place. Continuing with this thread, don’t miss the KissKiss House in Ontario, Canada. Here we see harmony at work, as the home skirts over rocks and anchors into the hillside, appearing to float over the ground. This is prefab that doesn’t feel like prefab—while there’s nothing wrong with boxy forms set in the landscape, this home really showcases true versatility, on par with standard construction. As with any evolving technology and practice, architectural prefabrication isn’t without its challenges. A steady stream of commissions, as well as adventurous, engaged clients, are needed for any firm to stay in business. So until prefabrication becomes a more understood, embraced, and utilized method of building, it will remain a challenge to find and support the specialized craftspeople that create these innovative structures. We hope that by continuing to herald exciting breakthroughs and unexpected practitioners, prefab will continue to prevail.